Pascal chilling in the Barcelona heat. Tee shirt made in Canada bought in Tofino. The shorts made in Europe, bought in Europe and the shoes made and bought in Spain. 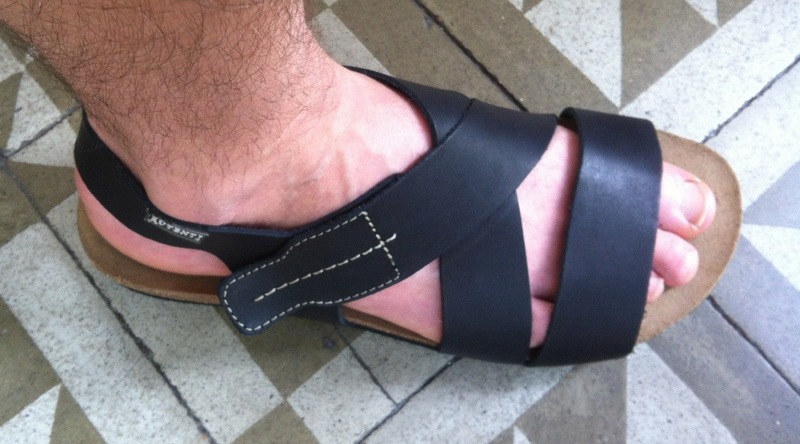 I love leather sandals on men. The feel is so…gladiator, Roman… Biblical. This entry was posted in Fashion, Stephens Sister's Shopping Diet, Style-Diet Shot and tagged ethically-produced, locally-made, organic clothes, Pascal, re-purposed clothes, recycled clothes, second-hand, Stephens Sister's Shopping Diet, Style-diet Shot, sustainable clothes, Thomas Jefferson on August 9, 2013 by Gurdeep Stephens.